COLUMBUS, Ohio — If you’re seeking the latest tips on when to give your sheep haircuts and what to feed lambs to be sold for someone’s dinner table, you can consult a newly-revived Ohio sheep blog. The Ohio State University Sheep Team blog offers easily digestible doses of research findings on raising sheep, keeping them safe and healthy, and the business profitable. After a six-year run ending in 2014, the sheep blog was relaunched in August 2017. Brady Campbell, sheep team program coordinator with Ohio State’s College of Food Agricultural, and Environmental Sciences (CFAES), manages the site and includes contributions from the more than 25 Ohio State faculty and staff interested in sustaining Ohio’s sheep industry. That’s why Campbell turns research papers into shards of advice that people in the sheep industry can use. Campbell is a third-generation shepherd whose master’s degree in animal sciences focused on sheep production, examining alternative management strategies to reduce parasitic infection. Recent sheep blog posts offer advice on shearing female sheep, letting female sheep graze on corn stalks left over from the harvest and determining whether sheep are resistant to common products that eliminate parasites. 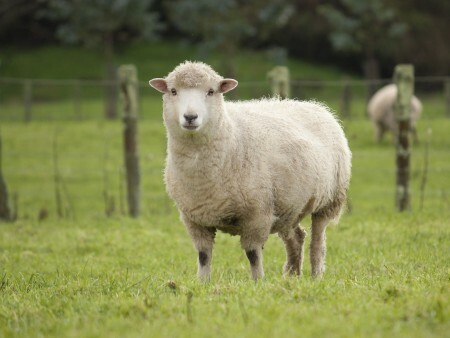 Managing parasites, one of the most serious issues for sheep raised on pasture land, is a particularly vexing problem for shepherds now, given that deworming medications no longer work for some sheep, Campbell said. Sheep become infected by inadvertently eating the parasites, then spread it through their waste to other sheep, causing them to lose weight and grow weak. Another key issue for shepherds is keeping records to ensure their sheep are properly identified and tracked, Campbell said. If a sheep has a weak immune system and performs poorly, it probably should be culled from a flock; conversely, if a sheep is high-performing, it’s important for a shepherd to know the sheep’s parents so that more sheep can be bred to also be high performers, Campbell said. Shepherds in Ohio have small flocks, keeping an average of 36 sheep, so some may not be apt to keep detailed records on them since their sheep operation does not provide their primary income, Campbell said. “A lot of producers have lost track of the basics of keeping records,” Campbell said. By putting the latest research findings on sheep information in a blog, Campbell hopes to attract younger people to the site and inspire them to raise sheep, if they aren’t already doing so. To view the blog, see u.osu.edu/sheep/.